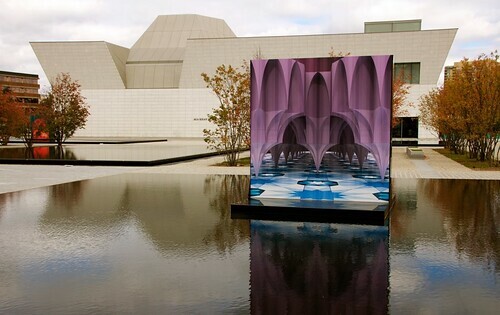 The Aga Khan Museum offers visitors a window into the artistic, intellectual, and scientific heritage of Muslim civilizations across the centuries from the Iberian Peninsula to China. Its mission is to foster a greater understanding and appreciation of the contribution that Muslim civilizations have made to world heritage. Through education, research, and collaboration, the Museum will foster dialogue and promote cross-cultural understanding. As a vibrant educational institution, the Museum encourages the full spectrum of public engagement with its diverse Permanent Collection of more than 1,000 objects and its changing roster of exhibitions and innovative programs — including music and dance performances, theatre, lectures, workshops, and film screenings. The Aga Khan Museum has an international mandate. It enjoys strong ties with such institutions as the Musée du Louvre in Paris, the State Hermitage Museum in St. Petersburg, and the Museum of Islamic Art in Doha while remaining deeply committed to forging relationships with Canadian institutions and communities. Together, these global and local connections generate exciting opportunities to enhance scholarship, inspire temporary exhibitions, and produce public programs honouring the spirit of collaboration upon which the Museum is built.